Last year’s Charm City Music Festival, with headliners Flogging Molly and Weezer, was the first legitimate music festival in Baltimore that I ever remember. This year they have renamed it The Shindig, and it is taking place the same weekend as last year’s music festival but in a different location in the city. 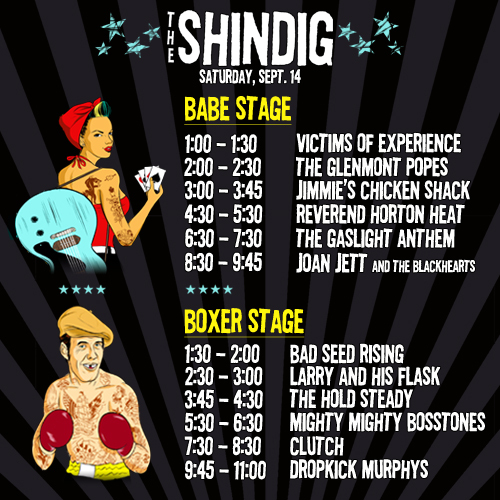 The Shindig is this Saturday September 15th from noon to 11pm at Carroll Park with headliners Joan Jett and Dropkick Murphys. This year I have a VIP ticket, which includes parking, VIP area and lounges, covered viewing decks, food and drink discounts, bottled water, Shindig Festival t shirt and laminate, and goodie bag. If you’re going to go, why not go in style? Two weeks later, on Saturday September 28th, is the second annual Main Street Music Festival in Ellicott City. This is Maryland’s first unsigned emerging artist music festival featuring over 75 bands encompassing nine live music stages at five venues and four outdoor stages. This year popular blues group the Kelly Bell Band is headlining. I am also very interested in seeing rock band Loving the Lie, whom I saw last year at the Charm City Music Festival. The Main Street Music Festival coincides with Ellicott City’s Fall Arts Festival. About 7,000 people are expected at the Main Street Music Festival strolling along Main Street enjoying all that Ellicott City has to offer. And the best part is, it’s FREE!